While shopping for an air mattress so I could sleep in the cool basement — it’s been a scorcher of a week so far — I wheeled my cart past the organic foods section and saw a rack of Pacifica roll-on perfumes on sale, including Tahitian Gardenia. In summer, I sometimes crave gardenia. At the same time, although I love big white flowers on other people, gardenia wears like a costume on me. It’s as if I’m wearing a fabulous hat that I love for about an hour — after which I wrench the blasted thing off my head so I can feel like myself again. After calculating that I could buy twenty Tahitian Gardenia roll-ons for the price of one bottle of Annick Goutal Passion, I tossed one in my cart. Tahitian Gardenia went on the market in 2007, and the Pacifica website lists its notes as including jasmine, sweet orange, and tea leaves. Is it too big? No. Tahitian Gardenia is definitely present, but it minds its manners. Next to Frédéric Malle Carnal Flower (the most gorgeous hat of all), it practically vanishes. Without Carnal Flower’s pulchritude as contrast, it’s a light white floral, more jasmine than gardenia to my nose. Tahitian Gardenia fades after a few hours, too, which to me is perfect for the summer. Besides, with a 10 ml roll-on selling for less than $10, I can reapply as often as I want. Is it too fruity or sweet? In the summer, the last thing I want is a gardenia that drips with peach, like Jungle Gardenia, or one that smells like a gardenia daiquiri. Tahitian Gardenia’s orange is dry and citrusy and barely present. (It was only by smelling it next to Carnal Flower that I picked it out.) Tahitian Gardenia’s dry down hints at vanilla, but it’s no cookie. The perfume passes this test. Is it too clean? A lot of popular white florals these days are loaded with laundry musk or orange blossom — or both. They smell like shampoo, or, worse, laundry detergent. Tahitian Gardenia is not indolic, but it’s not “perfume clean,” either. You’d never mistake it for Kai. Is it too dowdy? Gardenia can make its wearer smell like the Queen Mother. I want a light, summery gardenia that says “sundress” and not “powder blue matching ensemble with practical pumps.” Tahitian Gardenia isn’t serious enough to be dowdy. In fact, if you’re a gardenia lover, and gardenia fragrances suit you, you might not want to go down the Tahitian Gardenia path at all. But, if you adore gardenia but can’t fully commit to it, Tahitian Gardenia might be the answer. At its price, it can’t hurt to try. 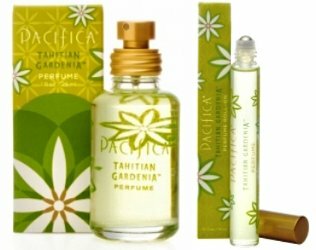 Pacifica Tahitian Gardenia comes in a wide range of body products and home fragrances. My 10 ml Perfume roll-on was about $9.50 on sale (at full price it’s $12). It's also sold in 29 ml Spray Perfume ($22) and 10 g Solid Perfume ($9). For buying information, see the listing for Pacifica under Perfume Houses. Tahitian Gardenia is one of my fav Pacifica, and I think rivals any decent white flowers fragrance from any house. I get a lot of fresand “clean” out of it, but not musky or soapy. It comes from light green and sappy accords that I smell. It almost doesn’t even have a base to my nose. It’s almost like an edc or just so simple for a nice pick me up. The body butter is very nice! A “pick me up” is a great description! I plan on tucking the roll-on in my purse for just that reason. I can smell the jasmine in the Aliage I am wearing. It’s a good season for jasmine! Which makes me wonder what the Queen Mother really did wear? Oh, that’s perfect! She must have smelled as feminine and welcoming as she seemed. I would buy the entire body range of Tahitian Gardenia immediately, if I had access to it. I love gardenia perfumes, but also white florals in general, so I am pretty certain that this would work for me. None of the cheaper brands availabe in Europe seem to have an equivalent of TG (I already own almost every single Yves Rocher Monoi product, but I think it has a different vibe, sweeter and more exotic). If anyone has a suggestion, let me know! Thank you for the reminder about Monoi! I need to try it. If you are ready to buy blindly, iherb.com has Pacifica products including perfumes and body porducts. This shop has international shipping, I used it myself and recommend it. You are welcome. Buying from a Dutch website, as Hamamelis suggested, sound like a good option as well. I have been tempted by French Lilac myself for a long time, and after reading Angela’s review I am interested in Tahitian Gardenia too. If you don’t have access to a Dutch speaking person to assist in the ordering process I am happy to help! You guys are all so kind. Annikky, I think you’ll be getting some Tahitian Gardenia soon! I identify completely with the hat analogy. I remember my obsession with the original Michael Kors and that Sand and Sable insert in magazines many moons ago. I bought both and never wore either after my initial trials of each. I’ll have to try this one. 2 that I’ve found and love and can wear all day are Tauer Sotto la Luna Gardenia and the AG Songes Monoi body oil. Thanks for the recommendations! I want to try the Tauer Gardenia, and definitely the Songes Monoi body oil. It sounds perfect for summer. I have the roll-on and the body butter of this one, and I agree with AnnS. TG isn’t indolic, but it’s not too “clean” either. For the prices, Pacifica makes really good stuff. Some of them – the fruity ones, mainly – are a bit too sweet for me, but TG steers clear of that. I’ve had a few of their other fragrances in various forms, too, and I’ve liked them. I have one of the fig diffusers in my living room now, in fact. I’m not a gardenia fan at all however I like Pacifica Sandalwood,Tibetan Mtn Temple and another one whose name escapes me at the moment but smells like Christmas with orange peel and cloves. I bet you’re thinking of Blood Orange. I should look for the Tibetan Mountain Temple in a candle, too. This sounds like a gardenia I could wear. Thank you, Angela. White florals are beautiful, but I quite agree that they can be a challenge to wear. For example, although I am a fan of Organza, I do not wear it often. And when I do, I am careful with the amount. It sounds like we have a similar response to many white florals. I adore them on others, but I have to be careful on myself.